What’s in the Clarins Box? Why should I give in? Order your box at Clarins.com or visit your participating Skin Spa. Have it sent to your house, your office, or to a loved one. Open it up and indulge! This box is a real little gem! 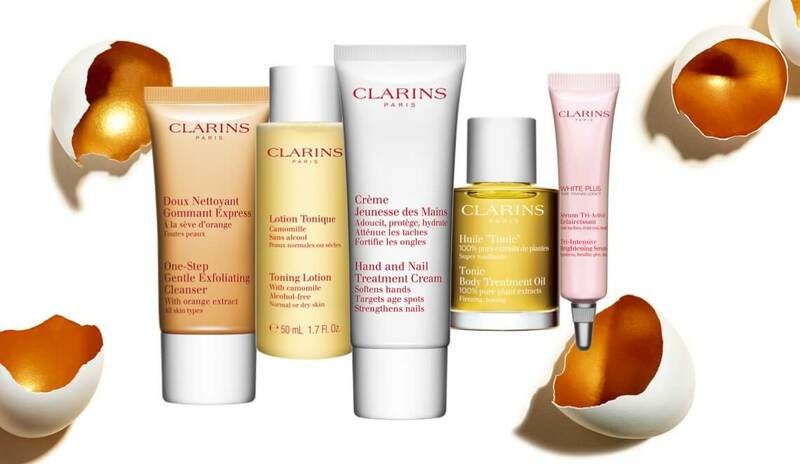 Discover a selection of legendary Clarins products that will enhance your natural beauty in the blink of an eye. purchased = £1 donated to the La Bonne Etoile association, winner of the 2017 Clarins Award for Children’s Rights. A creamy smooth gloss with a deliciously sweet scent and a touch of colour. Lips are nourished softer and gorgeous. Skincare that brings out your natural beauty! In just one application, wipe out signs of fatigue and restore skin’s youthful glow for radiant skin. Mascara that’s part skincare part make-up to give lashes an irresistible volume boost on the first application. Complete care for your hands that softens, protects, moisturises, targets age spots, and strengthens nails. This two-phase lotion leaves no traces of oil on the skin, while rapidly removing even heavy or water resistant make-up! Clarins is working to make life better for future generations.” Christian Courtin-Clarins. The Celebration Box was created for the Clarins Award to support Laeticia Hallyday’s association La Bonne Etoile, winner of the 2017 Clarins Award for Children's Rights. This association helps suffering children in Vietnam and now in France as well. For 20 years, the Clarins Award has provided long-term support to several non-profits to protect, educate, and help thousands of children around the world. We explain how to take the perfect selfie.